6.45 points at 11 votes (rank 537). 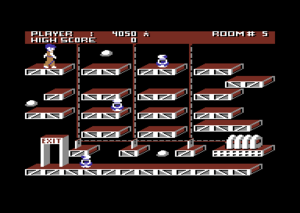 The aim of the game is to guide Ollie safely through 24 rooms. A locked exit can be opened with a key. If Ollie reaches the opened exit, he will enter the next room. After touching an "Energizer", Ollie's hair colour changes to white. Now he has five seconds to eliminate some robots. 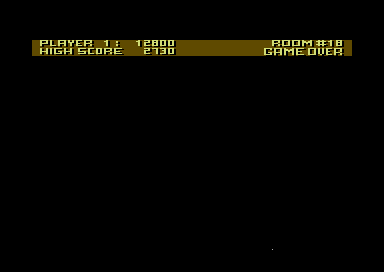 Simply kept, clear multicolour graphics without scrolling. The platforms are shown in 3D. Pleasant sound effects emphasize certain situations in the game. 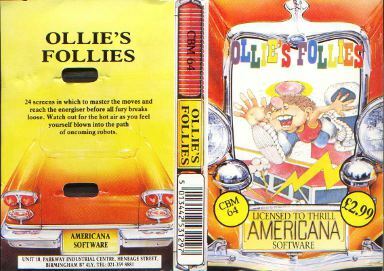 The title music was later built into the Americana version in 1986. In the upper status area the current player (1 or 2) is flashing. Further information as points, room number and highscore follow. There is no time limit. If the character is in a safe place, the room can be analysed calmly to find a solution. If you let go of the fire button after a jump, the character will move some more into the viewing direction. 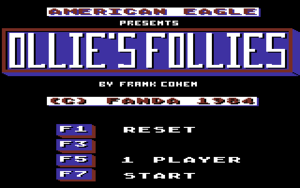 A password system was built into the version by Americana. 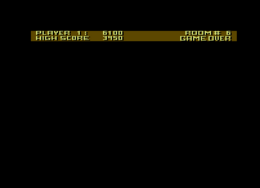 If the password is entered correctly while the game is running the player gets into the desired room. Werner: "A stable Jump & Run game without big weaknesses. The difficulty grade is balanced, there are no unfair situations. But the game is also no big highlight. Upscale mean - I give 8 points for the Americana version." 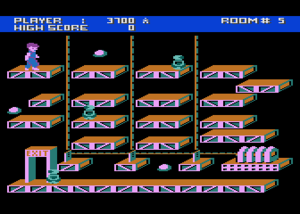 The Atari 8-Bit version plays the title melody a bit faster and the sound effects a bit smoother than the C64 version. Controls and game speed are almost identical.